Who would have thought that I would be waking up today to a winter wonderland of 2 feet of slushy snow after having slipped through a surprisingly warm (and dry) holiday season? Well, it looks like Spring has not sprung yet over here, so we may as well keep knitting to stay warm! So far, 2012 has been good to me (all 14 days worth!) and I thought a free knitting pattern may bring more good fortune for the rest of the year. 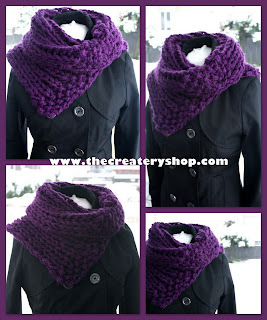 I call this pattern my 'EASY 3C' pattern, Chunky Collar Cowl. It's very easy to knit and very fun to wear (as you can see!) I just love that deep purple against the fresh white snow in my backyard! So hopefully all of you are having a good start to 2012 and if not, I hope this fun and free pattern will make you feel better, enjoy! Copyright © 2012 The Createry Shop. All rights reserved. The Createry Shop patterns are protected by copyright. You may not post, rewrite, redistribute, copy, or resell the patterns in any form. Patterns are for personal use only and is not for mass production. You may not sell the items made from the patterns without written permission from The Createry Shop. Size: One size fits most. Finished item measures approximately 15”wide by 22” circumference. - 2 balls (3.5 oz/100grams, 109 yds/100m) of Loops & Threads Charisma yarn, Bulky #5, in color dark purple. - Size US19 (15mm) straight knitting needles. - Yarn or tapestry needle. 1) Cast on 28 sts. 2) (RS) *K1, P1, repeat * to end. 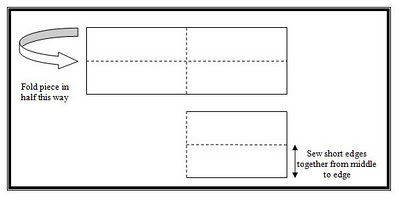 3) (WS) *P1, K1, repeat * to end. 4) Repeat steps ‘2 to 3’ x one more time. 5) (RS) *K1, P1, repeat *to end. 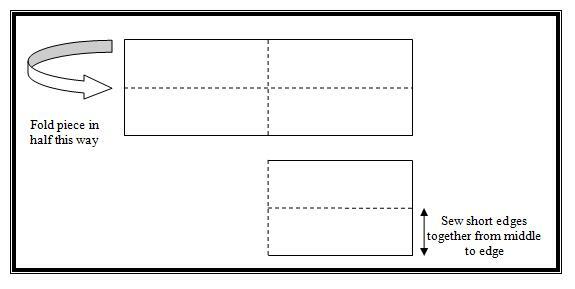 6) Repeat step ‘5’ until piece measures 20 inches from beginning edge, ending with a WS. 7) (RS) *K1, P1, repeat * to end. 8) (WS) *P1, K1, repeat * to end. 9) Repeat steps ‘7 to 8’ x one more time. 10) Bind off all stitches. Securely tie off last stitch. 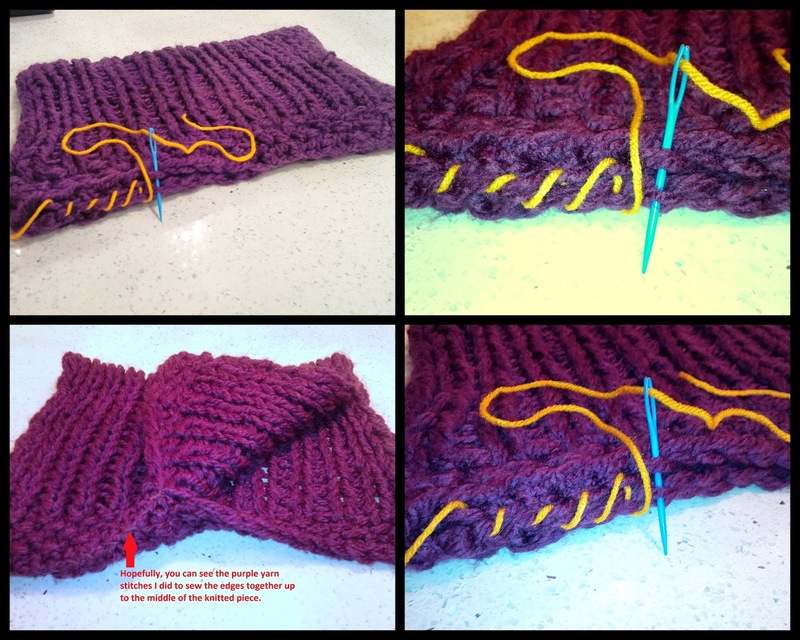 I've been getting a few questions on how I sew up the sides of the knitting piece. Here are a few photos to show you what I did to sew up the sides together. I used a different color yarn to show up better, however in one of the pictures hopefully you can make out the actual purple yarn that I stitched to sew up the sides to the middle of the knitted piece. I hope this helps! Ahh, 2012. 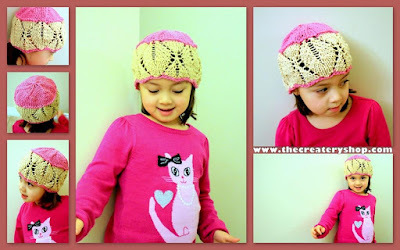 My first post for the new year and what better way to start it off than back to what I love knitting most, hats for children. I've actually been knitting like a mad-woman lately. It's all that season of giving that just makes me want to create more and more (and also give more too!). I have quite the optimistic soul for this brave new year, hopefully you do too. If not, well there's nothing a little knitting can't help right? Here is my latest creation, a lovely leaf lace border around the knitted hat makes for a wonderfully cute head piece and just enough lace tones to make it complicated to knit, even though it's not! 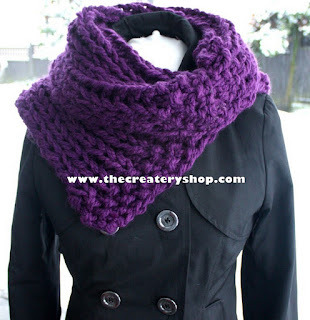 Click on the buy now button below if you would like this pattern asap! - Knitting Pattern in PDF Format. - Step-By-Step instructions that are easy to follow and comes with a list of abbreviations for clarity. - Size: (0-6 months, 6-12 months, 1-4 years old). This is a knitting pattern in PDF document format! The pattern will be e-mailed to you within 24 hours of receiving payment. I can provide the pattern in other formats if needed. So please ensure that you provide your correct e-mail address. 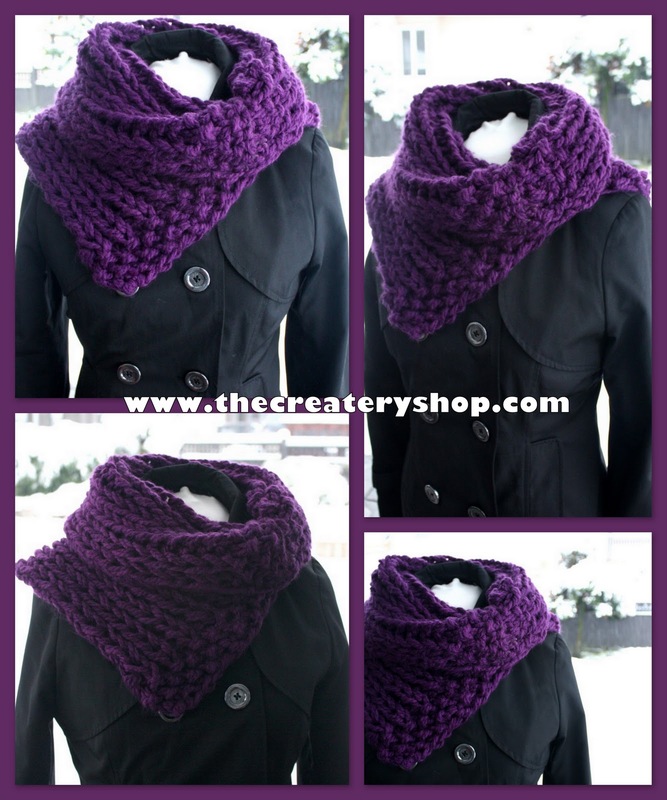 Please contact The Createry Shop if there are any questions or help needed with the pattern. Don't feel like knitting? I can make it for you! If you would like to receive the item made and shipped to you, just contact me for more information.